This article is part of a series of short, informative articles designed to assist entrepreneurs and business people to become aware of how a business lawyer can help them understand business legal issues. Should I incorporate or not? First of all, when a company is incorporated it is divided into units called shares. The “owners” of the company are called the shareholders. There may be one or there may be several. This share structure provides flexibility for the entrepreneur as the company grows and develops. Shareholders enjoy the limited liability benefits that incorporating has to offer. This means that, as shareholders, they are only liable to the extent of their investment in the company (i.e. how much they paid for their shares). If the corporation has any debts or liabilities, the shareholders’ personal assets will not be available to creditors of the corporation, unless the shareholders have guaranteed the obligations. The latter is one reason why I urge you to always consult a lawyer when signing any contracts, obtaining financing, entering into leases, etc, in order to ensure you understand the implications of what you are doing. An incorporated company is a completely separate legal entity from you, and/or any other shareholder in the company. This is the basis for the limited liability benefit described above, and further, it allows for the perpetual existence of the business (therefore allowing it to be sold, or otherwise dealt with). With a sole proprietorship or a general partnership on the other hand, there is no legal separation between the business and entrepreneur and in order to deal with the business, it involves dealing with the personal affairs of the proprietor or partner. Corporations are taxed at a lower corporate tax rate than individual proprietors. Sole proprietors and partners are taxed on business income at the higher personal tax rate because in those cases, income derived from business is taxed as personal income (remember the ‘no legal separation’ issue of unincorporated businesses). Corporations are better suited to attract outside capital than unincorporated businesses. One chief reason for this is the flexibility a share structure provides in taking on investment. For example, instead of incurring debt, which would be a negative entry on a balance sheet, as a sole proprietorship is limited to in order to access outside investment capital (*without changing the control and fundamental structure), a corporation can issue shares in return for investment funds. This will result in an increase in share equity, which is a positive entry on the balance sheet. Control can also be maintained as the share structure can be arranged in a way that the people involved agree to. Individuals may have access to a capital gains exemption under the Income Tax Act (Canada). This means that if certain criteria are met, on the sale of on the sale of shares of a qualified small business corporation, the individual could be exempt from income tax on capital gains of up to $750,000. 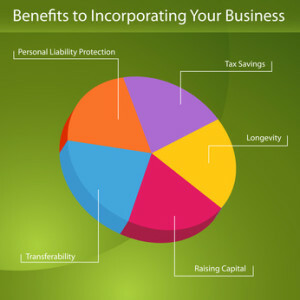 Incorporating a company involves higher costs to start up as well as maintain. Although the cost can vary, in Nova Scotia the total costs will generally be in the $1500 – $1600 range on average (including a name search / reservation, legal fees and government fees and other disbursements). There are also yearly fees involved to maintain the corporate / business name and registration, and if you want your lawyer to act as recognized agent there will be a fee as well. The list of things to consider can be endless, and depends on your individual situation. For example, in cases where there are more shareholders involved, shareholders with spouses, an opportunity for income splitting, and the list goes on. You are urged to always consult a lawyer to determine what and how to best structure your business. on that note, please feel free to contact me at the law firm to discuss whether incorporating is right for you, and how to structure your corporation based on your individual needs and goals.Click to Contact Garnet.